We're recapping some of the biggest moments from around the country in what proved to be the most chaotic state championship weekend yet. With 13 championships across the United States, performers made sure to throw down in some star-studded battles. Let's get right into the action. The Northwestern state might get overshadowed by the East Coast for a lot of reasons -- not as much access to coverage, time zone difference, a lackluster regular season filled with tri-meets. But don't get it twisted. By year's end, we might see some of these same teams and athletes at national meets. Take the Class 4A boys race, for example. Lewis and Clark were in the national rankings at No. 22, but they finished fourth behind Camas, Central Valley, and state champion Tahoma. Only 19 points separated Tahoma's winning score from Lewis and Clark. On an individual front, Mount Si's Joe Waskom will be a player on the national stage. He won in 15:16.20. In the Class 3A boys race, No. 12 Kamiakin dominated with 37 points. An even more dominant team performance? That came in the Class 3A girls race, where No. 12 North Central ripped through its competition with a nearly perfect 21-point score. Team average: 18:36. 52-second spread. The team will be a player at a loaded NXR Northwest Region. One more girl to note. Bellarmine Prep's Ella Borsheim is just a freshman, but she had the fastest time of the championships in 17:36.10. Times were screaming on Saturday at Detweiller Park in Peoria. No. 3 ranked Katelynne Hart, of Glenbard West, got her first 3-mile performance under 16 minutes, authoring a winning time of 15:59.82, her third straight victory in the state. Freshman Katrina Schlenker, of Batavia, was second in 16:07.31, while Naperville North's Alex Morris was third in 16:10.41. A total of 15 girls broke 17 minutes on the course. But let's stick on Hart for a second. Her time now ranks second all-time just behind Judy Pendergast's 15:53.80 from 2015. The Glenbard West junior, who went out in 5:10 for the first mile, now has three performances under 16:10 all-time. On the team front, it was an absolute bomb show. Three of the country's top 15 girls teams stacked up in the Class 3A race. What separated the first two? Just seven points. The No. 3 ranked Naperville North Huskies got its third victory in four tries over Yorkville on Saturday, putting down an 80-point showing behind a 16:58 average and 67-second compression. The No. 8 ranked Yorkville girls were second with 87 points on a 16:59 average and 63-second spread. On the boys front, it was madness up front. The major players projected to possibly win ultimately came up a little short. That meant Hersey's Josh Methner got his first state win in 14:11.50. Again, this race played fast. A total of 45 boys in the Class 3A race broke 15 minutes. There were 52 boys across all classifications that went under 14 minutes. No surprises here. Ann Arbor Pioneer's Nick Foster won his duel with Plymouth's Carter Solomon by five seconds. Foster won the LP Division 1 title in 15:13.00. Rockford's Ericka Vanderlende was a class ahead of anyone in the girls D1 field, winning in 17:08.40, exactly 50 seconds ahead of the next closest girl. Jaden Theis won the girls Division 2 race in 18:01.90. Otsego's Alex Comerford was the winner in the D2 boys race in 15:23.60. Adelyn Ackley and the Hart High girls won D3 titles. Ackley finished in 17:42.80. And super freshman Abby Vanderkooi of Muskego Western Michigan won her first state D4 title in 17:47.30. It was her 13th race under 18 minutes and her 14th race overall. Merrimack Valley (NH) freshman Sophia Reynolds beat Manchester West senior Julia Robitaille in the girls race. Reynolds was the only runner under 18 minutes, posting a time of 17:59.60. Concord's Forest Mackenzie was the boys winner in 15:48.00. He was the only runner under 16 minutes. Georgia's state championships are absurd: Seven different classifications and 14 races broken up into two days. The biggest performances of note? 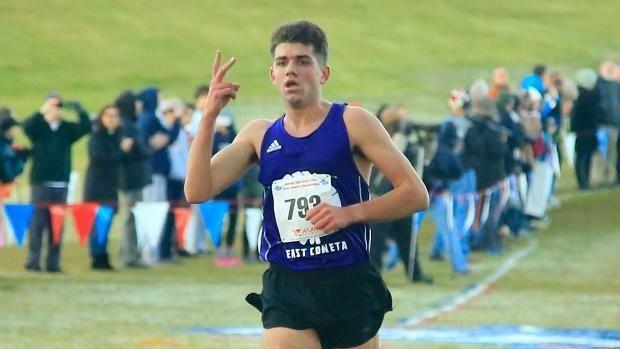 In Class 7A, returning Foot Locker Nationals qualifier Kyle Harkabus got his first state title in a time of 16:08.55. The best race of the championships came in the 6A boys race, where Richmond Hill's Jalen Murray nabbed Cambridge's Jack Filan in the final stretches. Murray finished in 15:58.45, Filan came through in 16:00.02. Woodstock's Brynne Sumner, a recent Villanova commit, scored the fastest girls time in 18:36.39. Colin Baker is having himself a season. The Academic Magnet senior ran the fastest time of the day in 14:48.53 to score a commanding win over Sam Boykin, who followed 66 seconds later. That's Baker's second sub-15 minute performance of his season and over a minute improvement from his win last year in 15:54.00. 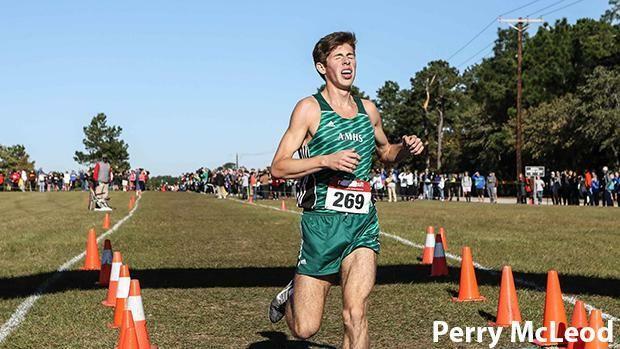 Baker wasn't necessarily a secret before this race -- he was third in a very good Great American field in October -- but this race only reinforces his potential at NXR Southeast or Foot Locker South. Plus, Baker has only raced four times thus far. The big power players in this state once again ran up to par. Northern's Marlee Starliper continued to shine in poor conditions, producing a time just three seconds off her effort from last year to win the Class AA race in 17:53.00. Two-time Foot Locker Nationals qualifier Taryn Parks was second in 18:49.00. In the Class AAA boys race, North Allegheny scored second and third place finishes from Zachary Kinne and Daniel McGoey to claim a team win with 90 points, illustrating the potential for the team at NXR Northeast. The Tigers were well ahead of second-place LaSalle College (112) and Downingtown West (121). Of note, North Allegheny also won the girls Class AAA race, making it the first time in Pennsylvania history a school had done so in both races. And in the Class A race, another runner to note is Loyalsock's Isabel Sagar, who finished in 19:12.00. The Harvard bound harrier could have some merit as a potential national qualifier.